Below is a Painter Master profile interview I did for the Corel Discovery Center’s educational site. The entirety of the feature is below or you can click here to check it out with more imagery and in context. Also, be sure to check out the latest version of Corel Painter 2019 right here. It really is the best version yet with lots of awesome features and a ton of great performance enhancements! "Using Painter’s expressive brushstrokes with dramatic lighting, I create striking moods within my work that go well beyond just illustrating the assigned story." Throughout childhood and his high school years, Dominick was exposed to a wealth of illustration by way of comic books, paperback covers, illustrated classics, album art and Dungeons and Dragon’s publications. Marvel’s How to Draw Comics the Marvel Way and an old Molly Hatchet album cover by Frank Frazetta (Dark Kingdom) were probably the most influential in motivating him to draw at a young age. Plus, he had a very encouraging high school art teacher who was an amazing artist by the name of Cheryl Hough who was instrumental in steering him towards a degree in the arts. It was at this time that it became evident to him that there were artists who made a living from painting and/or drawing for publication. He thought that it would be great to draw all day AND be paid to do so! Dominick then continued his education after high school in the Illustration Department at the University of the Arts in Philadelphia. Dominick has been juggling A LOT of projects lately: He recently just finished the latest book cover for Jack Campbell's Pillars of Reality series for Audible and is about to start the 6th and final installment shortly. He’s also working on a really awesome fantasy book cover for the fine folks over at Orbit Books. In addition, he’s spent the last month researching and working on sketches for an upcoming illustrated chapter book from Centipede Press called “Fafhrd and the Gray Mouser”. As for a favorite project, he usually finds something exciting in every project, but one that stands out is the work he did for The Science Fiction Book Club. It was creating four book covers for Taylor Anderson's Destroyermen series and includes a really great alternate universe with a “what if” story. It features giant WWII era battle ships, dinosaurs, and lizard warriors. What's not to love? Also, he had a blast working on the American Craftsmen series for TOR Books. Tinker, Tailor, Soldier and Spy meet ancient magic, all with the fate of the world hanging in the balance. So much fun! What’s a typical day for Dominick? His schedules have changed throughout the years. Right now, he’s typically in his studio by 9:00AM attending to emails and more clerical tasks over coffee. Once he’s finished with the more mundane tasks. he’ll have a quick bite and dive into whatever project he’s working on. He usually wraps it up around 7:00PM and sometimes a little later if a deadline is looming. 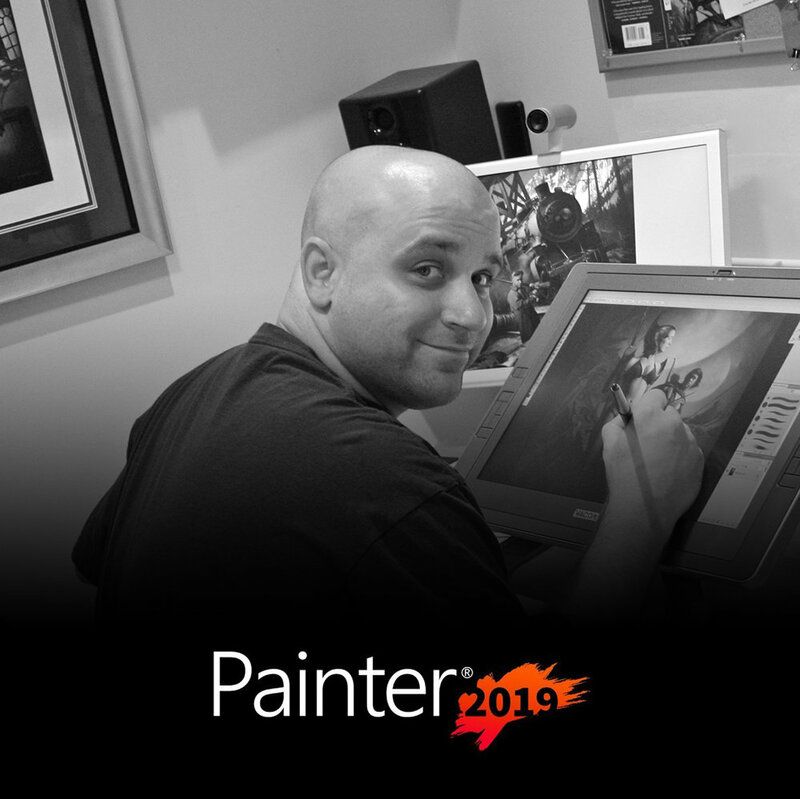 As for tools of his trade, Dominick enjoys the many benefits of Corel Painter. “I trained and worked in oil paint for years and Painter allows me to mimic the same analog style and brushwork while giving me the flexibility of a modern digital workflow. Painter brings back the joy of traditional painting in a digital world. In my work I vary brush strokes from very straight to more organic marks so I just love the way straight line and freeform mark making are implemented in Corel Painter. In addition, the way Painter’s brushstrokes interact with marks I’ve already put down is second to none. The “interact with underlying layers” toggle in the layers panel is indispensable for me. Real oils, Artist oils, several grainy brushes that pick up paper texture, and even a few impastos are a few of my favorites. Oh! The blenders too! As for his studio, besides the usual traditional tools, his digital setup consists of a fairly old 2009 Mac Pro, two smaller secondary Apple displays and a 20WSX Cintiq.